Did we just call out her name? Is she turning to us to whisper a secret? We lose ourselves in her gaze, and all of a sudden we feel a quickening of the heart…a charge of energy. We are in the presence of a masterpiece. Considered one of the most talented painters in the Dutch Golden Age, Vermeer was a genius in enhancing the sense of vibrancy and mystery through his paints. How did he achieve the intimacy of this smile? Look closely at the young girl’s mouth. 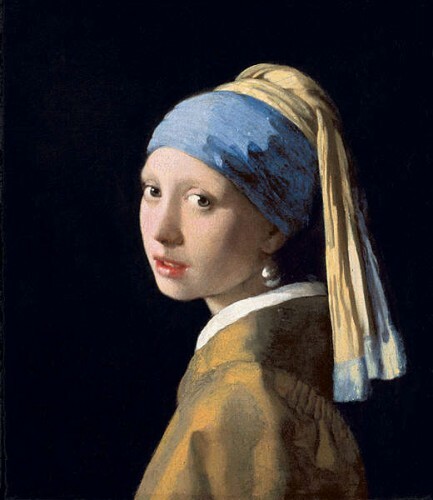 Two small white dots on either side of her mouth, echoes the highlights in her eyes and the light on her pearl earring. Voila! The young girl’s half smile is enlivened! How did Vermeer achieve the delicious colors of the turban, the cloak? The rich blue of her turban: The artist procured the blue rock, lapis lazuli, from Afghanistan traders. He then hand-ground the hard rock to powder making that incredible ultramarine blue. And her vibrant cloak: Yellow flowers gathered and boiled making that special golden earthy color. But knowing the “how” dims not at all our reverence for the painting. Returning to that face with the liquid eyes and sensual smile, we once again bask in the delight of being in the presence of a true and timeless MASTERPIECE. Your discussion of the Vermeer is a pleasure to read, Kirby. For me, as an untrained eye, these clues to appreciation which you offer open up the painting for me a lot. thanks! That was out of thePark!! Imagine the dedication of the artist to go through the arduous task of obtaining pigment to use. I appreciate that you brought this to our attention. Reading your blog has opened my world to culture I am not exposed to in my everyday life. Thank you! Jack is doing his art docent gig tomorrow on…Vermeer! I have to do Gauguin but they only want 1 session and just because he was a friend of Van Goghs…Christian school, remember. Gauguin did too many ‘native paintings’ to show much of his work. Once again you enchant us with your subjects and vivid commentary!!! I enjoyed the description. Vermeer would be pleased with your use of well chosen words. Enchanting, Kirby. A painting I’ve taught for years has garnered new luster due to your insights and graceful prose. Your blog gets just better and better!